Of all the what seem more frequent than usual these days recent sad passings in the music world the one that his hit me most personally is the so sad recent news of the death of guitarist Liam Davison who for many years was a huge part of my beloved Mostly Autumn. His time with the band stretches back to the original line-up of this fabulous British rock band formed by Bryan Josh back in the mid 90’s and apart from a very brief break from the band in 2007 was playing live and recording with the band until 2014. Apart from his work with Autumn which included classic albums such as ‘The Last Bright Light’, ‘Passengers’ and ‘Go Well Diamond Heart’ as well as countless live shows he also released an impressive solo album ‘A Treasure Of Well Set Jewels’ in 2011. A friend of mine once made a comment that I agree 100% with which was that being such an accomplished and stylish guitar player Liam could have landed a lead guitarist role with many a successful rock band but seemed quite happy to play second fiddle to Mr. Josh in Mostly Autumn although Bryan made sure he had plenty of times to shine particularly live and the best examples are the times he turned in a virtuoso solo guitar performance of ‘Spirits Of Autumn Past (part 1)’ before the whole band rocked out on part 2. 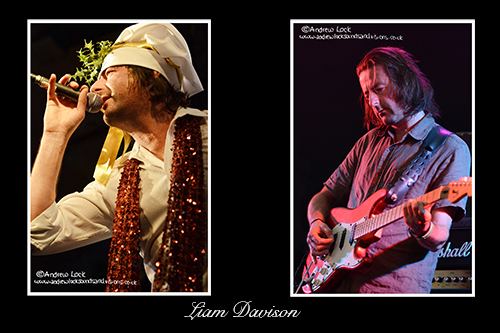 Some of my other cherished memories of Liam are when at Mostly Autumn christmas gigs he would don tinsel, a santa hat (and on one occasion at least a chefs hat) to take lead vocals on a full on performance of Slade’s ‘Merry Xmas Everybody’. I did not meet or chat with Liam as much as some of the band as he kept a little more to himself offstage but when I did have a chance for a few words he was always charming and a complete gent. What a sad sad loss this is and my love goes out to his family, the band, his friends and all of us in the wonderful Mostly Autumn family, you will be very much missed.